Just like every Valentine’s Day, there are a lot of places to choose from to bring your special someone to. WindsorEats is hoping to make it a little easier as we showcase what some restaurants in Windsor-Essex are offering this Valentine’s Day weekend. It’s not too late to make your reservations. Call up one of the restaurants below and be sure to tell them WindsorEats sent you! Valentine’s Day 3-course dinner for two for only $49.95. Includes 2 appetizers, 2 entrees and 2 desserts. The regular menu is also available. This Tecumseh restaurant is offering an a la carte menu with Valentine’s specials. Reservations are available. 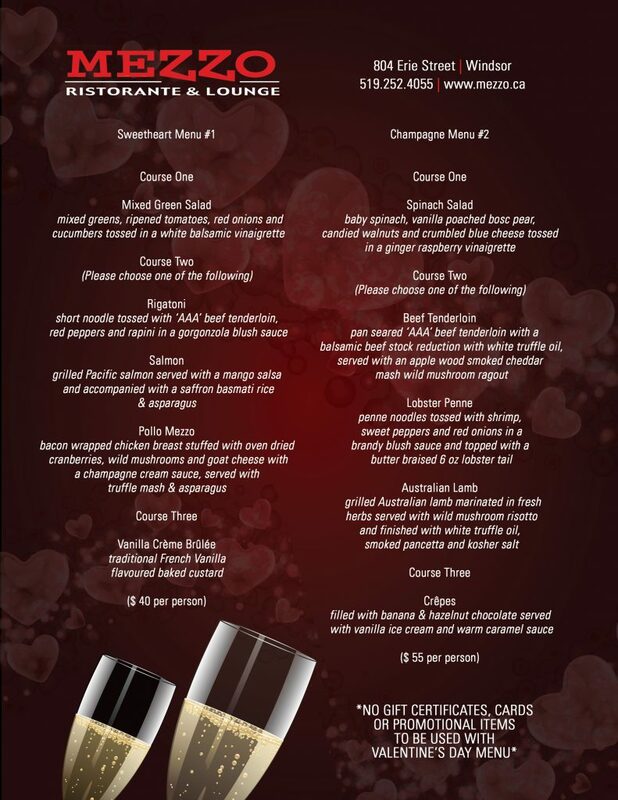 Make your Valentine’s Day reservations between February 11-14, 2011 and choose one of their two seatings each night. Dine from their regular menu or pick one of their ‘Dinners for Two’ and share! You can also make it a romantic evening and book their Valentine’s Sleep Inn package which includes dinner, accommodations, flowers and champagne. As everyone at Jack’s will tell you, this is one-stop shopping to put you in the ‘good books’ for the rest of the year. Call 519.733.5070 to make reservations. The restaurant with a great view of the Detroit River and Lake St. Clair will be having a Valentines Specials all weekend. Friday and Saturday night Dine & Dance with Green Eyed Soul. Reserve by calling the restaurant at 519.944.8332. This popular Via Italia restaurant is offering it’s patrons two options for Valentine’s Day: A 3-course ‘Sweetheart Menu’ for $40 or a 3-course ‘Champagne Menu’ for $55. You can view Mezzo’s menus by clicking here. Enjoy an overnight getaway at the Hilton on Saturday, February 12, 2011. The package includes a 1 night accomodation, a romantic dinner for two at the Park Terrace Restaurant over a bottle of sparkling wine and brunch for two on Sunday, February 13, 2011 at the Park Terrace. All this for only $199. This fantastic restaurant located within the Art Gallery of Windsor is offering a Valentine’s Dinner Prix Fixe a few days early on February 11, 2011. The cost is $45 per person. Taste Bud is also offering a Valentine’s Brunch on Sunday, February 13, 2011, from 10:30am to 3:00pm. Reservations are required.